S4 Random Search Selector enhances the capabilities of your security staff at checkpoints by eliminating the human element in selecting individuals so no discriminatory practices can exist. The S4 Random Search Selector is the most ethical way of providing a non-discriminatory selection process for choosing individuals to be searched. With the S4 Search Selector it is impossible for anyone to feel they are the subject of persecution or prejudice as it is electronics that randomly pass or stop any individual. The S4 can be customized to fit into any environment including the ability to interface with electric door strikes and be activated through pressure mats, push buttons and photocell sensors allowing it to be used in a variety of security situations. This makes the S4 search selector ideal for any search checkpoint at places such as airports, tourist attractions, government buildings and places of work. Since the S4 Random Search Selector can�t be accused of selecting somebody because of his or her ethnic background or personal dislike, it provides the security staff with the ability to do their job without the worry of being blamed for discriminatory practices. 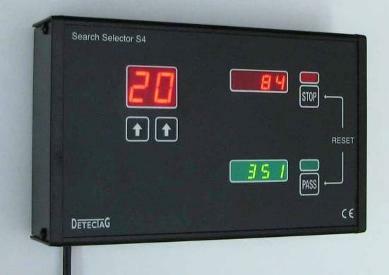 The Search Selector can also work together with metal detectors as either a selection tool to choose who to go through the metal detector or after as an extra security step. The �Direction box� is perfect option for this application with the large visual arrows to direct traffic. It is also perfect for occasions where a metal detector can not be used. At a prominent retail chain the S4 is used at the employee and visitor entrance. When an employee or an unsupervised visitor leaves they press the push button for either a green or red light. If the light is red they have to show their bag. The personal doing the searching has to then produce a report on the findings. At the end of the day a manager turns on the displays and checks how many were searched which would then match up with the reports, he then resets it for the next day. This quick and effective method has drastically reduced any employee theft. Similar to the retail location, one warehouse found their electronic products to disappear. With more than a hundred employees, searching everyone is not possible but something had to be done. With the help of the search selector employee theft fell drastically. Now it�s even used when shipments come in, by having the shipper press the button for if shipments are verified or not, reducing any chance of a delivery being skimmed. In airports the search selector is used in some places as a way to see which bag should be checked, 100% randomly, no discrimination possible. It is also used at the employee entrances and places where metal detectors can not be used. Our search selector is used in mining operations for both trucks and personal when they leave. With hundreds of staff, searching everyone is too time consuming, so with the help of the search selector it provides the same level of protection with less time consumption. There are many other ways the search selector can be used in operations. It is a proven tool and suitable for today's world of discrimination lawsuits and time restraints. All products are manufactured in Canada and carries a 3 year warranty. 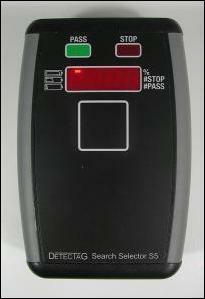 An Optional Direction Box provides a visual indication for a pass or stop. This works well in a high volume settings or as a tool to keep the flow of traffic where Metal Detectors are use. A new S5� Mobile Search selector is now available as well. Contact us for more details.